Hello - new user transferring from autocad. 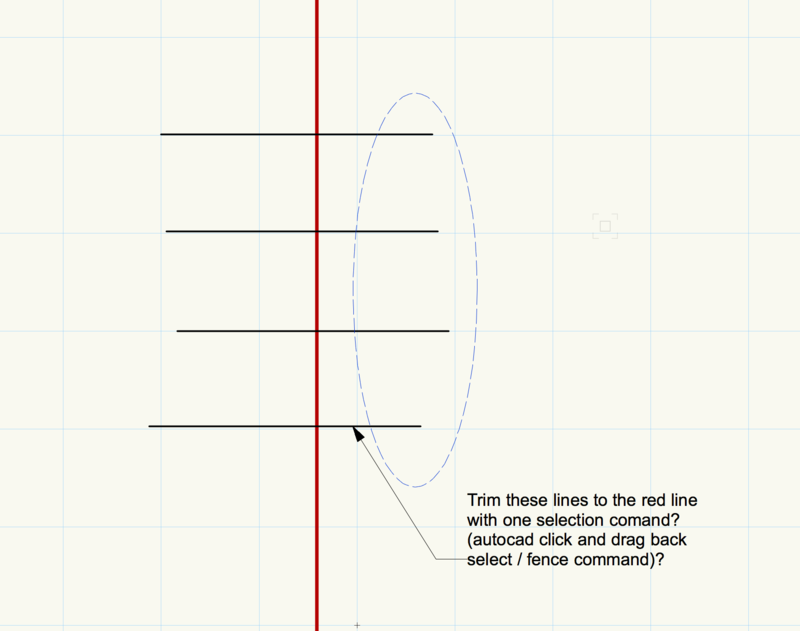 Question 1 - Is there a similar command to the 'fence' select tool in Autocad. ie trim or extend multiple lines to one cutting line with a click and drag selection? see attached diagram. Question2 - Is there a 'previous command' short cut. ie hit return in Autocad and it loads the previous command. Question 3 - Is there a 'Select Previous' ( 'P' keyboard command in Autocad) option in Vectorworks? Q1. Yes. Option key+selection tool is the same as fence. The Connect/Combine tool on option 3 should give you what you need. Q2. No, not that I am aware of. With regard to shortcuts. You can assign your own from the Workspace manager. I migrated some years ago from AutoCad and was tempted to replicate the shortcuts that I was familiar with, but on advice I didn't and am happy that I slowly learned the Vectorworks shortcuts. It makes it a hell of a lot easier in the long run as the Help files, online tutorials and forum posts here will almost always refer to the Vectorworks standards. until you choose something else. Like the Line Tool in ACAD. 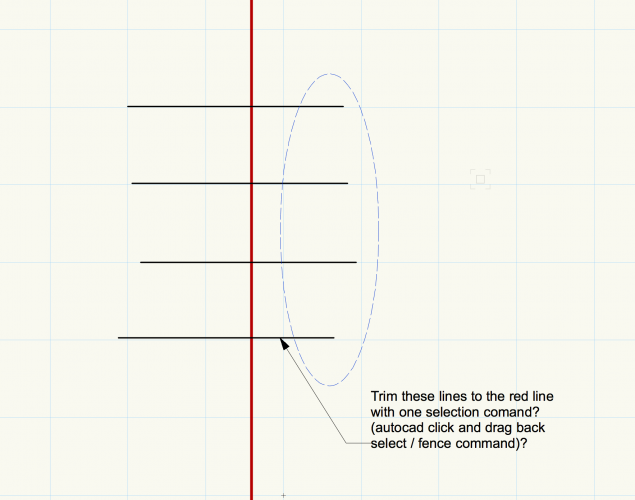 Activate the Tool and draw multiple lines. The same happens for any Tool in VW, like Rectangle Tool. Start it and you can draw one rectangle after the other for 2 years if needed. you did one Command and want to do further edits. (CTRL in Windows ? ), which will activate a temporary Selection Mode.